It’s 6pm and my 8 month old is having a great time! He’s crawling all over the bed laughing. I’m kneeling at the end of the bed laughing with him. He crawls towards me and I lift him up into the air, both of us laughing together. I’m delighting in him. I’m not distracted by being on my phone, or doing jobs, or dividing my attention with my 6 year old. I’m 100% engaged with George. I play a little bit of ‘Peekaboo’. I hide my face behind my hands and then reveal myself and say ‘Boo’. Peals of giggles from my baby. I then say “Boo” again. More giggles. So I repeat and repeat until the giggles start to subside. And then he crawls off again. He’s learned about not going over the edge of the bed. But I still hover nearby, just to be sure. His Dad comes in and plays some more. Lots more laughter, giggles and delighted squeals. (I love those squeals!!). And then it’s time for bed. I change him, feed him and lie down next to him while he easily drifts off to sleep at about 7.30pm. He next wakes up at 5.30am. Why am I telling you about a fairly normal playtime with a baby? After all, it’s a typical scene of parents delighting in their child. Because conventional wisdom tells us to have quiet time before bed, to calm babies & children down at least an hour before going to sleep, so that they drift off easier to the land of nod. We can then become obsessed about dampening down their excitement, their exuberance. We curtail their laughter and fun so that we can impose sleepiness on to them. However, by allowing them free range to squeal, to move around and to just basically have lots of fun with us, we are filling their strong need for connection, for play and also for release. All of these things then help them to sleep much, much better. 1. Your baby or child may start to have a tantrum or cry. We can often curtail boisterous activity due to the fear that “It’ll end in tears”. But tears can be a great thing! A tantrum which leads into a cry allows your baby/child to release some of the emotions from the day. It’s like a safety valve releasing the build up of pressure. The loving, warm connection actually enables the tears. They feel our warm loving presence which allows them to offload any tension. Once much of the tension has gone, they are far, far more able to sleep better. It’s like with us: Have you ever woken up in the middle of the night worrying about something? And then not being able to get back to sleep because of the worry? I have. Lots of times. As adults we learn lots of ways to deal with our stress and tension. What’s great about babies and young children is that they innately use their natural release mechanism of tears and tantrums. So, allowing your baby to have a good cry with you before bedtime can be invaluable. The other side of play and connection before bed is that your child easily goes off to sleep. Laughter is also a fantastic form of release and, what appears to be ‘just fun’ is actually also nature’s way of offloading tension from the day. My example of playing ‘Peekaboo’ and then just saying “Boo” allowed George to release any tension around separation from me (when I hid my face) and from unexpected loud noises (when I said “Boo” in a staccato and playful way). I “followed his giggles”, as advocated by the fantastic author and psychologist Lawrence Cohen in his book Playful Parenting. And I kept repeating until his giggles subsided and he then moved onto the next thing. After playing for quite a while, I could tell that George was starting to have enough. His cues showed me he had had enough and was ready for sleep. Hence he then slept really well. Now I’m not saying that if you played uproariously every night your baby or child will become the dream sleeper. There is never any guarantee! 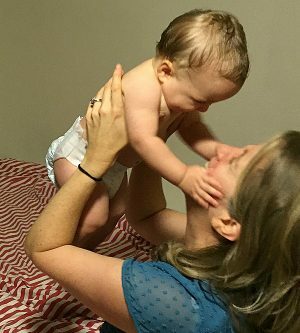 But, what I am hopefully conveying is that play is a wonderful way of getting your baby or child ready for bed and that it has very real benefits for the whole family! So, next time your baby is delightfully squealing, or your children are laughing and wanting to jump on the bed, maybe you could join in the fun too. Instead of being the serious, ‘you-need-to-go-to-bed-now’ parent, you could use their desire for play and connection with you as a very useful strategy for everyone to get a better night’s sleep. Plus, you’ll all have fun in the process!